Marvel’s Greatest Comics #57, 1975 (originally FF #75, 1968) | Magazines and Monsters! You know, I think Marvel reprints are great. Yeah, it would be nice to own the original books, but since I’m a pauper, this is the only way I’ll ever see these great stories (or in trade)! 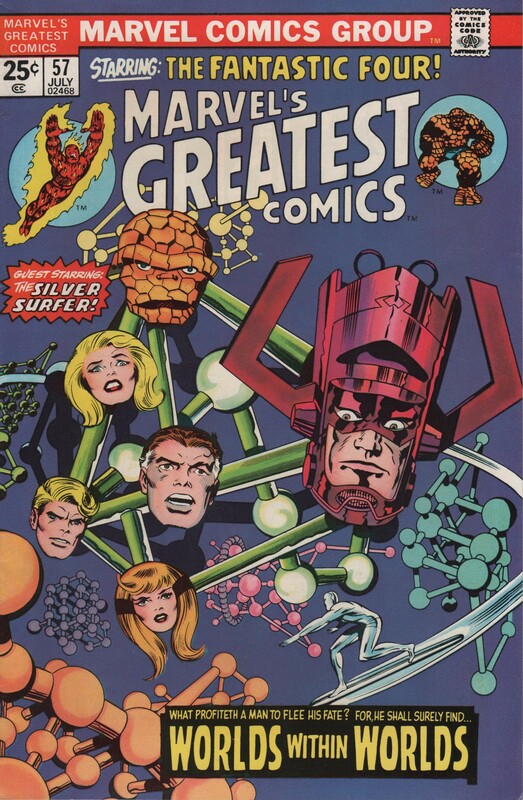 Seeing the wondrous artwork by Jack ‘King’ Kirby always puts me in a good mood, if I wasn’t in one already. 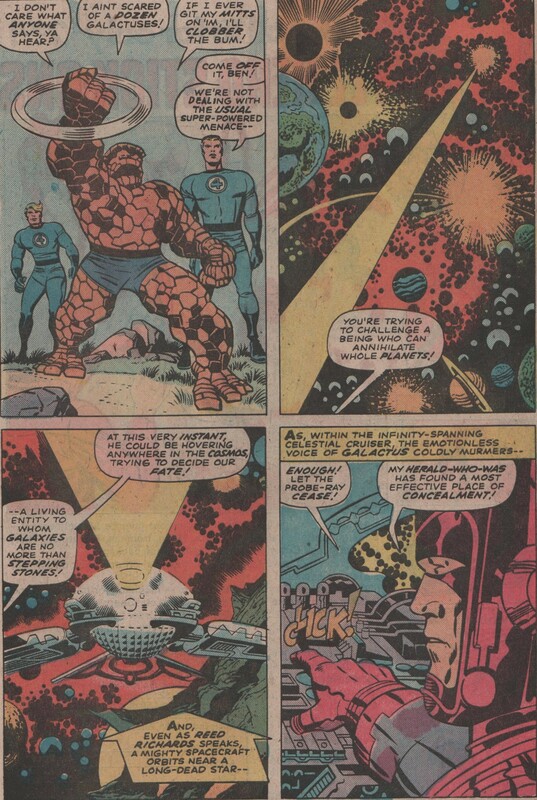 In this feature, Lee and Kirby give us a wonderful tale about the Fantastic Four, as they prepare for another visit from Galactus. Well, before that visit is upon them, Reed, Johnny, and Ben, must battle duplicates of themselves that are programmed to kill them! 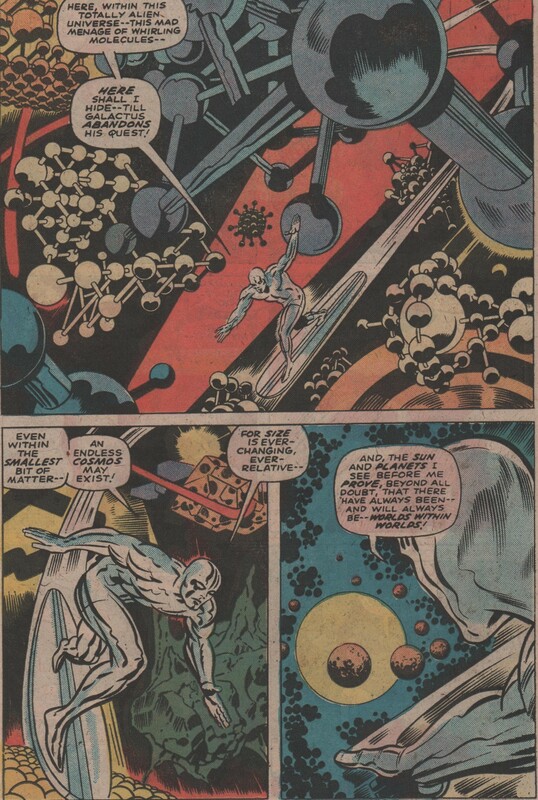 We also get some incredible cosmic work by Kirby, as he illustrates the awesome Silver Surfer, as he scours the space-ways! Sue however, is down and out, and being cared for by Crystal (of the Inhumans). By issues end, the team is making a deal with Galactus that will either save the world, or bring it to its doom! Check out these cool panels below by the one and only king of comics! See you back here in three days! And I have never, ever had the chance to read FF #75. I’ve always been curious to find out what happened next in this story. It looks cool, with the Silver Surfer in the Microverse. 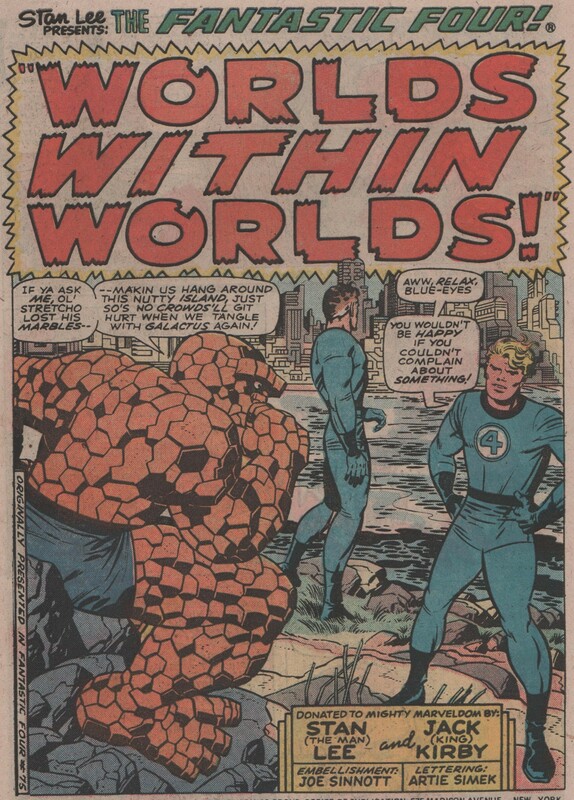 I really should finally pick up a copy of Essential FF Volume 4, which collects those issues, along with plenty of other Lee/Kirby/Sinnott goodness. You can’t go wrong with some Jack & Joe!